In the golden age of steam, railway lines were built all over Mexico. Rail quickly became THE way to travel. Depending on your status and wealth, you could travel third class, second class or first class. Anyone desiring greater comfort and privacy could add their luxury carriage to a regular train. To avoid mixing with the ordinary folk, the super-rich and the privileged few hired or ran their own special trains. The railway era ushered in an entire new genre of travel writing, which culminated in the first genuine guidebooks, describing routes and places that other travelers could visit with relative ease. The earliest comprehensive guide to Mexico was Appletons’ Guide to Mexico (1883); it was soon followed by several others including Campbell’s Complete guide and descriptive book of Mexico, first published in 1895. Here again the tourist finds another feature of Mexico’s scenery and people, totally different from all the other travels in the Republic. The houses are adobe as to walls and thatched as to roofs; the broad plains have curious trees; bands of Indians troop from one town to another in curious costumes, marching along totally oblivious to the passing locomotive and approaching civilization, and will not give way to the latter any quicker than they will to the engine if they happen to be on the track when it comes along. In fact, it is hard for them to understand that the train cannot “keep to the right” when it meets people in the road, and they claim the right of way from the fact that they were there first. A decade later, the British-born journalist William English Carson (1870-1940) spent four months in Mexico. Carson also visited Cuautla, on the advice of a doctor as the result of catching influenza. Upon making inquiries at the railway office about trains to Cuautla, the clerk handed me an illustrated pamphlet with a fine colored picture on the cover representing a Mexican tropical scene. It bore the title, “Cuautla, Mexico’s Carlsbad.” What! I thought, another Carlsbad? In glowing language the booklet described Cuautla as an earthly paradise with a magnificent climate, beautiful scenery, splendidly equipped hotels and a warm sulphur spring whose waters were a certain specific for almost every human ailment. What more could one desire? 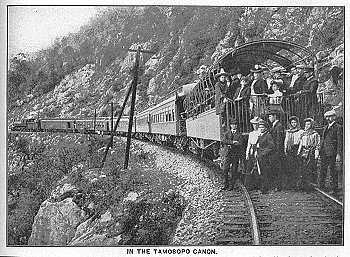 Railways may have opened up Mexico for tourism, but today, sadly, there are virtually no passenger lines still operating, the main exception being the justly famous Copper Canyon line from Los Mochis to Chihuahua. The growth of the railway network and the importance of railways in Mexico are examined in depth in chapter 17, and tourism in Mexico is the subject of chapter 19. of Geo-Mexico: the geography and dynamics of modern Mexico.